Like many states, Oregon is seeing tens of thousands of homeowners who are losing their homes in the ongoing foreclosure crisis. A state bill in Salem has grabbed headlines recently, but Southern Oregon is home to one of the most innovative and aggressive pieces of homeowner organizing in the country. Project REconomy has literally written the E-book on how homeowners can stand up to banks and predators who want to take their homes. “Oregon has two types of foreclosures,” explains Nancie Koerber, co-founder and director of Project REconomy (formerly known as Good Grief America). “Judicial foreclosures require the oversight of a judge to make sure that homeowners receive the full protection the law offers.” But these judicial foreclusures are not the biggest source of the problem, according to Nancie. Wait a second! So, people who are still making payments lose their homes? That can’t be right. It seems like there must be a misunderstanding. But Nancie has plenty of examples to share. Amanda, a single mom with a three year old son, lost her home in a divorce. Her name was still on the title and note, but the property was abandoned by her ex-husband who neglected to make payments. After learning about her rights, Amanda chose to take back her power. Project REconomy assisted her and her son with getting some legal help and regaining possession of the home. She is now living in the home and negotiating with the bank for a sustainable solution. In response, Project REconomy has been working with homeowners to resist unjust foreclosures on a number of levels. They’ve turned their expertise into an Ebook for homeowners that outlines the foreclosure process. They’ve also helped homeowners take their cases to court, scoring their most recent legal victory in February, 2012, in a case to stop the foreclosure activities by a company that isn’t even a lender! 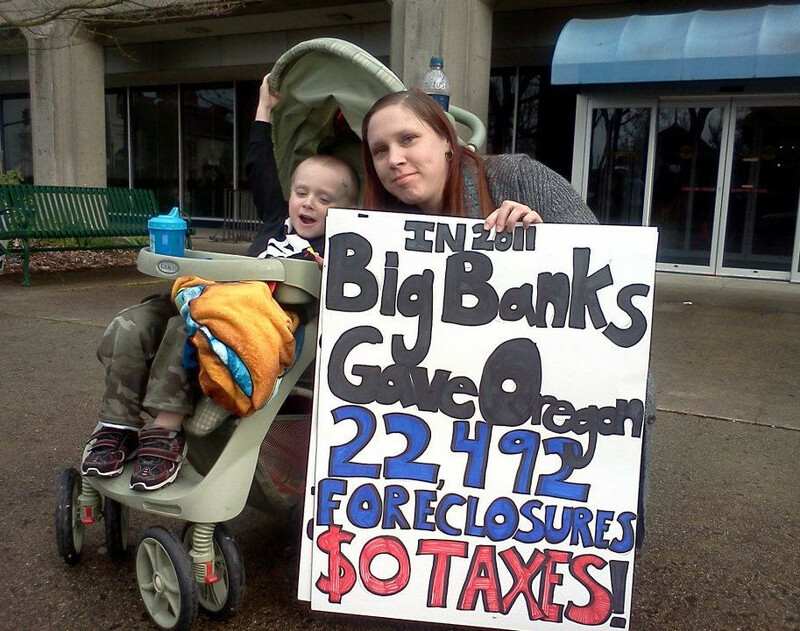 Learn more about what’s really happening with foreclosures in Oregon via their website, www.projectreconomy.org, watch their recorded teach-in video or join their national web teach-in on March 18th. Project REconomy will keep sharing what they’re learning with homeowners, or anyone who wants to truly understand Oregon’s foreclosure crisis. Project REconomy (formerly known as Good Grief America) was started by homeowners in Southern Oregon facing foreclosure, to help people push back against the banks forcing them out of their homes. Project REconomy restores economic justice and personal dignity to Oregon families by challenging Wall Street’s siphoning of money and resources out of our local communities and the economy. Project REconomy now serves over 1,000 members statewide.